Child Care Creative Shop design is an earthy illustrative design aimed towards the child care industry, but it would be suitable for any children’s, kids, family, art, craft, creative or environmental website. 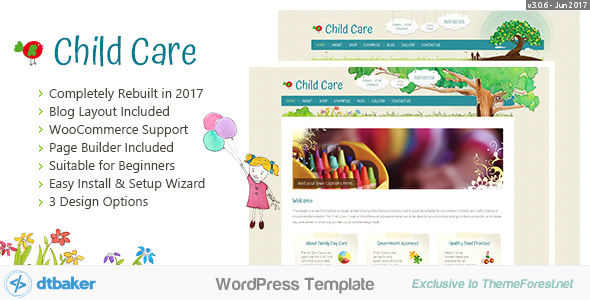 The Child Care Creative Wordpress eCommerce theme would be ideal for an online shop selling childrens products, an at-home day care center, or anything you feel would suit the design style. Child Care Creative theme was created with ease of use in mind. Everything from the 5-minute setup Wizard through to the powerful page builder has been designed with the end user in mind. Perfect for beginners to make powerful changes, and perfect for more advanced users with a clean and simple backend code structure. NEW! Check out our super easy Quick Reference Guides for this theme. Latest Update: Version 3.0.6 on 2017-06-13. This theme is comatible with the Elementor page builder. 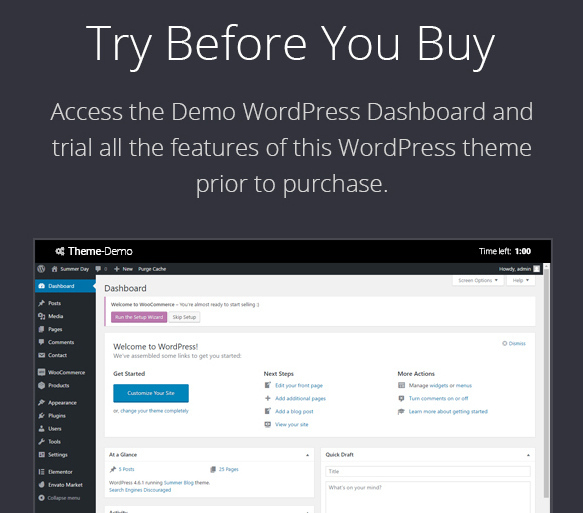 Elementor is a very powerful and very good WordPress page builder. Using Elementor will help you design amazing looking pages very quickly and easily. This theme is compatible with the Free version of Elementor. It is already extremely powerful, but you can take it to the next level by purchasing the 3rd party Pro version. For a small extra fee you get access to great new features such as: Form Builders, Slides, Portfolio, Global Widgets, Custom CSS, Pro Pre-Made Templates, WooCommerce addons, Flip Box, Masonry Layout, Share Buttons and much more.